Does Your Care Home Lost Property Room Look Like This? 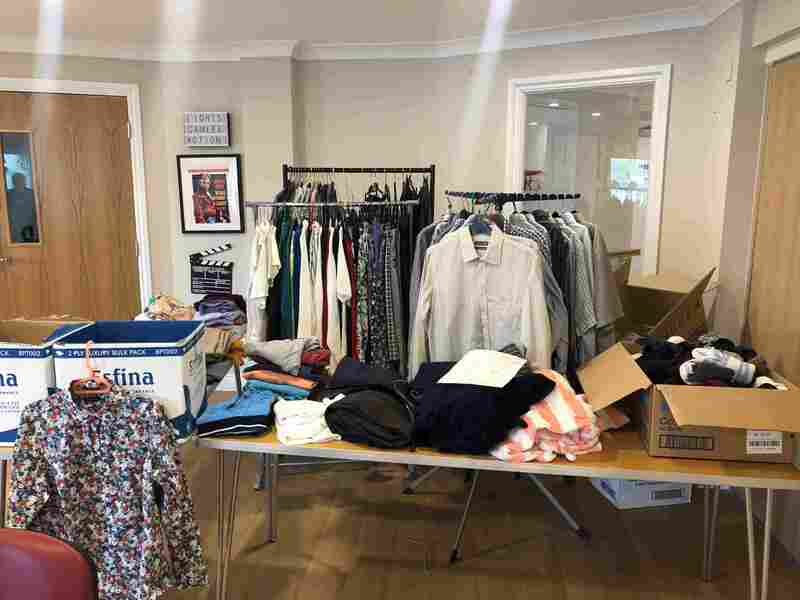 With so many clothes to handle its easy to see how care home lost property rooms can look like this. The Fixxon clever clothes labelling system is a laundry label created as a quick and efficient way of identifying clothing. The clearly marked, colour-coded buttons are simply attached to garments using the specially designed tools. The unique attachment and printing system is designed to be comfortable and discreet on all items of clothing, and also to withstand the extreme temperatures and chemicals encountered throughout the laundry process. For ways of reducing care home lost property have a look at our shop for the range of buttons we offer. See you tomorrow at the Dementia, Care and Nursing Home expo in the NEC! Say goodbye to lost laundry and hello to your new labelling system…. Pop by our stand to discover our easy to install sustainable labelling Solution. The Fixxon clothes labelling system ensures an extremely time efficient and cost-effective solution to labelling residents’ clothing. Come and see us at stand D422 to see how we can introduce Fixxon into your care home. Contact us for more information about the Dementia Care & Nursing Home Expo event or to know more about our care home clothes labels. We’re exhibiting at the Dementia Care & Nursing Home Expo! The Dementia, Care & Nursing Home Expo is the UK’s only free event dedicated to growing the social care industry and achieving a sustainable social care model. 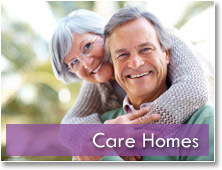 CPD accredited seminars which focus on sustainable social care will run throughout the event. See us at the Dorset Care Conference 2019! This year we are excited to be exhibiting at the Dorset Care Conference on 7th February. This conference gives us the great opportunity to meet with you face-to-face, and give you first-hand experience of our labelling system. We often tailor our approach in introducing the system into different homes based on their unique needs. So come and say hello to us at our stand for a chat and a demonstration, you can even have a go at using it yourself there and then! We hope you can make it to the Dorset Care Conference. For more information about other care home and labelling events we’ll be attending in 2019, please get in touch. Wishing all of our wonderful customers a Happy Christmas! We are excited to introduce the new colour range of our laser-etched buttons at The Care Show this month! Come along to our stand at the NEC to chat with us about how we can help colour code your care home! There are millions items of clothing are washed every week in UK nursing homes. It’s not surprising that residents’ clothing gets lost. Sometimes it can be a name label which has fallen off leaving the garment unidentifiable or the writing from the marker used has faded leaving the name unreadable. Relatives find it very distressing to see their loved one in the wrong clothes. Lost and incorrectly named clothing is one of the most common complaints that families of residents have about their relatives care home. Nursing home staff spend many hours a week searching through lost property and residents’ rooms to find mislaid clothing. This is time that could be devoted to caring for residents. Fixxon laundry labels for nursing homes are discreet and resemble small buttons, making them comfortable and unobtrusive to the wearer. Names are permanently etched into the tag, ensuring that they will never fade, even in harsh laundry conditions. Fixxon laundry labels for nursing homes are simply snapped onto the garment seam using the applicator.. 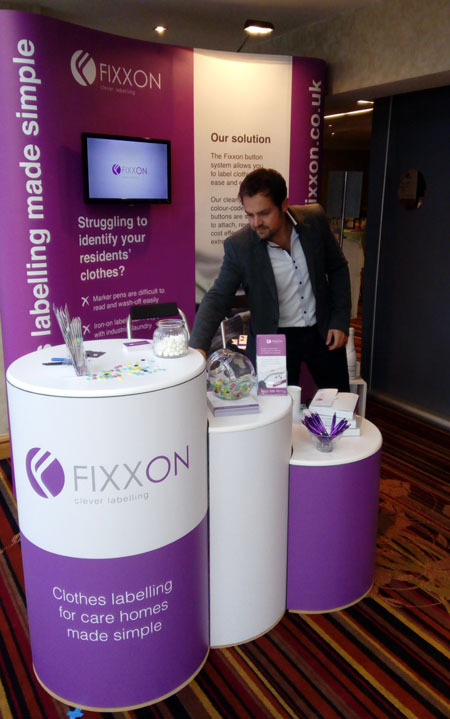 The Fixxon clothes labelling system ensures nothing gets lost and the staff, relatives and residents have one less thing to worry about. The tags have saved hours of time for our laundry staff and have provided peace of mind with the residents and their families for their items of clothing. Contact us for more information on our labelling systems. Fixxon have just launched a new smaller range of clothes name labels. The etched buttons are smaller which makes them more discreet and less noticeable. It also means that they are easier to apply as the fastener does not have to be stretched as far. The new etched button labels are smoother than original buttons – they cause no discomfort to the wearer as they are more rounded. This will be a relief to many of our customers who have sensitive skin. Our new buttons are also more economical at about 5p less per button! Please contact us for more details of our new range of buttons. Fixxon have released a new product for attaching laundry labels for care homes and commercial customers called the ‘Combi-Gun’. The key difference obetween the combi-gun from our original gun is that it has a built in attacher tool (at the bottom of the handle). This means that the process of attaching the buttons is quicker and easier. All our commercial customers will be receiving these guns in the future. 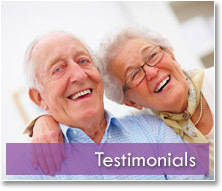 We have a wide range of commercial customers including the NHS and the Salvation Army. If you would like to find out more about our labelling systems please call us +44(0)800 096 4011. Identifying residents’ individual garments is very challenging in any care home. 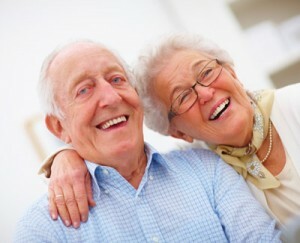 Fixxon clothes labels for care homes button system helps to make life easier by labelling clothes easy and efficient. Residents in care homes would have their clothes name labels put in by their families in the past. The common methods of iron on and marker pens wash off very quickly in a care home laundry and sew-on labels are very time consuming to attach. 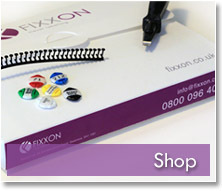 The small buttons are simply attached using the specially designed Fixxon toolkit. 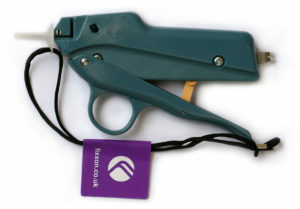 The unique attachment and printing system is designed to be comfortable and discreet on all items of clothing. Fixxon laser etched buttons, smaller, slimmer and even easier to attach. Ideal clothes labels for care homes. The buttons are able to withstand the extreme temperatures and chemicals encountered during the laundry process. Available with room numbers or names in either black or white. Buttons come with the corresponding number of fasteners.